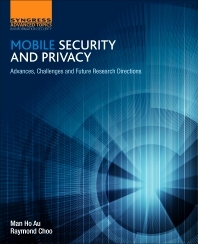 Mobile security and privacy research communities and practitioner communities. Information Security professionals, legal and compliance professionals, high-level undergrad and post-graduate students as well as government policy makers. Dr. Man Ho Au is an assistant professor at the Hong Kong Polytechnic University. Before moving to Hong Kong, he has been a lecturer at the School of Computer Science and Software Engineering, University of Wollongong, Australia. His research expertise lies in information security and privacy. He has been an active member in the research community, having served as a program committee member of 15 international conferences in the last five years. He is also the program committee co-chair of the 8th International Conference on Network and System Security. Due to his excellent research track record, he has been appointed as the program committee co-chair of the 9th International Conference on Provable Security, to be held in Japan next year. He is an associate editor of Elsevier’s Journal of Information Security and Applications. He has served as a guest editor for various journals such as Elsevier’s Future Generation Computer Systems and Wiley’s Concurrency and Computation: Practice and Experience. Despite being an Early Career Researcher, Dr Au has contributed enormously to the research community as shown by his publication and citation records. Since 2009, he has published 18 journal articles, including the well-respected IEEE Transactions on Information Forensics and Security, IEEE Transactions on Knowledge and Data Engineering and the ACM Transaction on Information and System Security and IEEE Transactions on Vehicular Technology. This is in addition to 29 articles accepted by refereed international conferences, including the ACM Conference on Computer and Communications Security (CCS), the top conference in security and privacy research. His research has been recognized internationally, in particular in the area of privacy and accountability. Two of his papers that appeared in the ACM CCS conference were named as “Runners-up for PET Award 2009: Outstanding Research in Privacy Enhancing Technologies”. Au has delivered invited talks in this area in various reputable universities around the world, including Indiana University (USA), Harbin Institute of Technology (China), the University of Electronic Science and Technology (China), Sun Yat-sen University (China), Fujian Normal University (China) and Hong Kong University (Hong Kong). His Google Scholar H-index is 20.